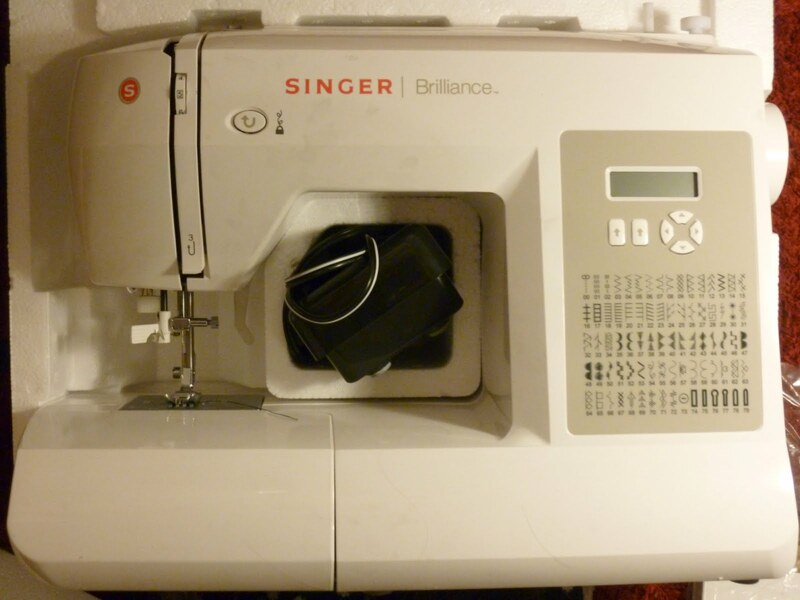 For Christmas, I got my very own sewing machine. I feel like this is another little step in my quest to become a self-sufficient adult. When I asked for one I was expecting a little cheap portable thing, but instead I got this, 'The Beast'. I don't know much about sewing machines but I know that Singer is a good brand and it was probably embarrassingly expensive. I intend to make very good use of it and am quite excited to start, although I have no table to use it on. I shall hunch over it on the floor and probably operate the foot pedal using one knee. Ah, the joys of student housing. 'The Beast.' I should think of a more friendly name for her. Any ideas? Altering all the men's t-shirts I use as pyjamas into nicely-fitted t-shirts that I can wear out of the house. I often have trouble finding even women's t-shirts that fit nicely as I'm quite an unusual shape (short and skinny but with an ample chest.) I've accumulated about 10 large t-shirts from various sources including my little brother when he grew out of them and a couple of past boyfriends. Taking up pyjama bottoms to fit my short legs. Making whole new pyjama bottoms, they should be super easy! Making needle books- little fabric books with felt pages for keeping needles and pins in. Making a silky quilt out of a few outdated nighties I've inherited from my mum. A tea dress- using my very first sewing pattern that I found in a charity shop for 20p. Making my own underwear. How hard can it be? And once I've found a pattern that fits I will never have to spend £6 on a pair of cute lacy knickers ever again. A stuffed dinosaur or loch-ness monster. Making a couple of cushion covers to replace the ratty brown ones I have. 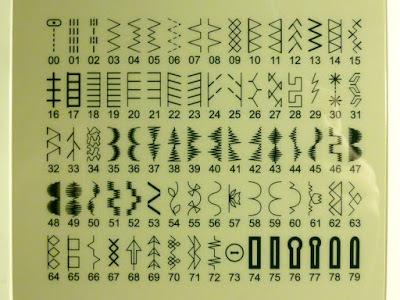 This will double up as an embroidery project (but not cross-stitch.) I'm thinking detailed hand-embroidery of crows and magpies, a big bumblebee, a stag beetle maybe with a fox curled up in his abdomen, geometric shapes. I'll have to draft out some ideas for it soon. I'm not an experienced sewer at all, I know how to thread a machine up but I've only done straight lines before. I'll admit I'm a little intimidated by all the settings and the extras it came with, there are about 10 different replacement feet and attachments for making button holes. The controls are all different and it's got an electronic display rather than all the knobs and dials I'm used to, but I like a challenge. Somebody, help! 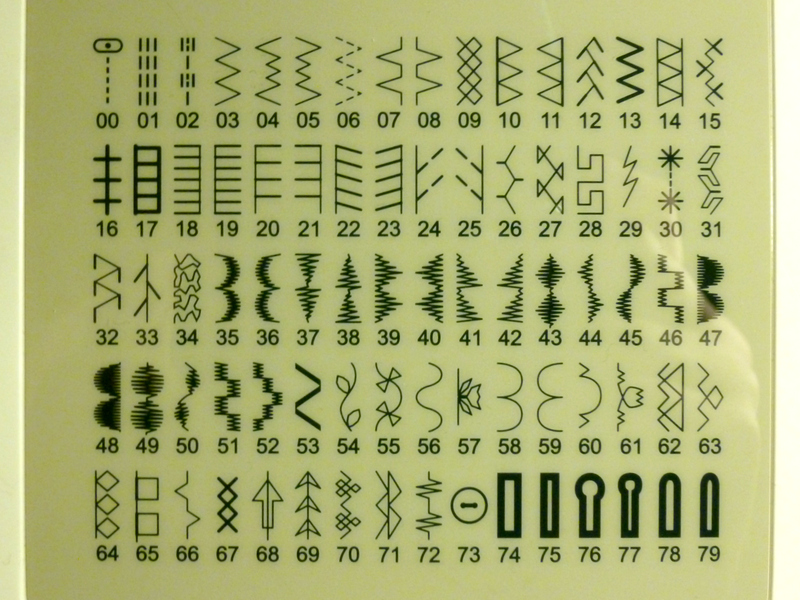 What are all these for? And what is up with stitch number 34? Technology amazes me; I am going to have a lot of fun playing around with all of these settings. Maybe I'll have a few helpful tips for those who are also new to sewing machines.